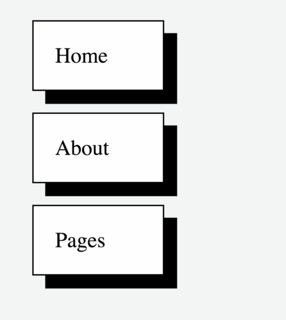 I have a design of navbar in mind that I want to implement for my web page. Please see the drawing I created using Inkscape. I read the tutorial on w3.org and there is an example of adding padding to a list in navbar. I am thinking if that method could be extended to create the shadow in my design or there is a better way. You can create the shadow with the CSS's box-shadow. The first two values are the offset values, the third is the blur radius (we want a solid shadow so set it to 0). There is an optional fourth numeric value that controls the spread (i.e. makes the shadow bigger or smaller; we've left that out). The last value is, obviously, the color. Not the answer you're looking for? Browse other questions tagged css html drop-shadow or ask your own question. 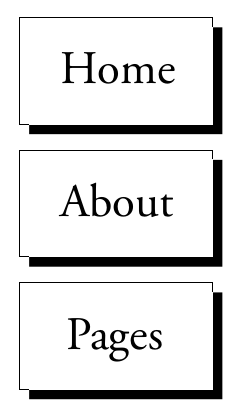 How can I slice parallelogram shapes to HTML/CSS? Does Photoshop also pull HTML? Or just CSS? Is there an HTML/CSS version of the StarCraft 2 Menu buttons?